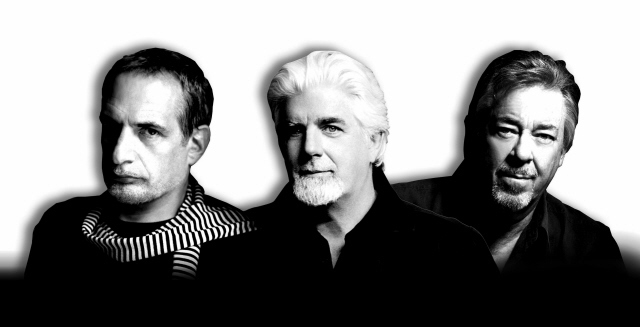 Donald Fagen, Michael McDonald and Boz Scaggs want you to know this from the get-go: This is not a greatest-hits tour. You’re not going to hear Steely Dan numbers (well, maybe just one -- setlist spoiler here). They’ve dubbed themselves The Dukes of September to further reinforce that this is them going out, having fun, and playing songs you’ve likely not heard before – not by them, anyway. The trio recently got on the phone with music journalists to talk about the tour. Below is the gist of what was said, edited, mangled and shortened by yours truly. Click "read more" for Part I. Can you talk a little about the repertoire and what you'll be playing? And if there has been anything that is a surprise that has come up? In '92 Walter (Becker of Steely Dan) was a very last minute addition to the traveling ‘New York Rock & Soul Revue.’ Any word coming from Hawaii? This is a question for Michael and for Donald. The two of you have a long collaborative history. What do you think is the key to how well the two of you in particular have worked together over the years, and continue to work well together still? Will the three of you be stronger draw than the three of you individually? Any thought on that line going through your head? Could each maybe talk about a song, a classic song that you maybe want to perform, and one that was significant to you, that really influenced you or an artist that influenced you? Fagen: “Well, we're still narrowing down the material. Actually, what I've been doing with Levon (Helms’)'s band that I'm thinking of doing in the show is a Grateful Dead tune that's kind of a couple decades later than most of the material we're doing. It's called ‘Shakedown Street.’” And it wasn't the typical Grateful Dead song because it had a kind of dance beat to it. I think they were kind of cashing in on the disco craze or something like that. But it's a fantastic song with a beautiful lyric and it gets a great response every time that we do it. And so I think I'm going to try to put that in the show. Anyone else? The band name, is that a play on "Boys of Summer," or where did that come from and what does it mean? What solo projects are you working on these days? When you're looking at your solo material, does that make you feel obligated to perform some of the bigger hits, like Michael had alluded to, for keeping everyone happy? Or does it give you more impetus to pull out some rarities of your own? What would you consider the pluses and minuses of performing live as opposed to in the studio? Scaggs: “Well, one is performing and one is sort of more exploratory. Speaking for myself…the studio is just for me a chance to try things out and explore things with a certain lineup of players and just work out some ideas. Whereas performance is something that you can then refine, it's all there, the picture's already painted. Then you go out and explore various ways of performing. And that's just a different kind of release. I remember when I was recording more frequently and touring more frequently, when I was on the road I was sort of at a point to be eager to get back to the studio, and the same with when I was in the studio, I wanted to go out and play. So they're really just two different elements to me. Obviously you all are big fans of each other, is there one song that you feel like, “I'm not letting this guy get off stage because I want to hear it.”? Which song or songs by the other two guys would you each consider a must to include in the show, maybe each of you can answer that? I was just wondering if you guys think that your original material is seeing a resurgence in the past like 5 years, so especially with Mike's music. All three of you all have been known throughout your careers for just your impeccable taste with backing musicians. I don't know if you all can tell me a little bit about who you got backing you up this time, and how you all settled on them. I was wondering if you could each individually flash back to the past for me and talk about your favorite tour ever and what was so special about it. Did you three ever feel competitive? How do you guys go about learning a new song? I'd love to hear whether or not you've considered giving each of you a spot where you're singly alone on stage doing a song, or if the three of you would consider doing a song or two together, just the three of you without any backing musicians? Scaggs: “I'm listening to Ry Cooder. There's an album called ‘I Flathead’ that I've been listening to. And then he made one with, I think it's one of the Cuban guitar players, it's called (Los Quaneros) they call themselves. A couple of Ry Cooder CD's for me.